The Washington-based Turkish news website Washington Hatti first reported on Wednesday that Yildirim was one of the men arrested. Lucy Usoyan, the woman kicked and stomped by Yildirim, Narin and other Erdogan supporters, told TheDC that she went to the hospital where she was diagnosed with head trauma. Narin, who was first identified by The New York Times last month, acknowledged to the newspaper that he kicked Usoyan. But he claimed that he thought that Usoyan was a man. Usoyan, a Kurdish activist, said that she feared for her life during the assault. She also said that her doctor told her she would need six weeks to fully recover from the beating. Yildirim and Narin were part of a group of supporters of Turkey’s president, Recep Tayyip Erdogan, who showed up at the Turkish embassy. 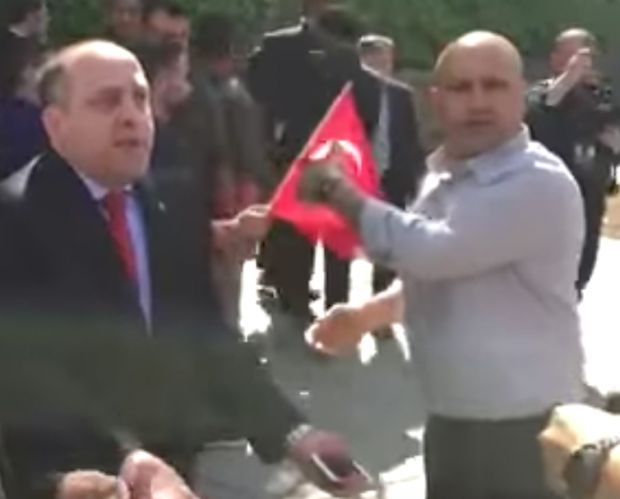 Video of the incident shows a large group of Erdogan supporters and bodyguards suddenly crossing the street in front of the embassy to where the smaller group of protesters were staged. 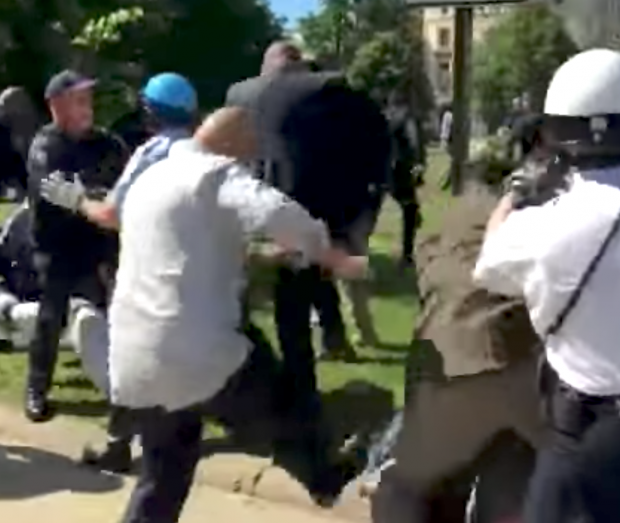 The Erdogan henchmen, some of them armed, were then seen punching, kicking and stomping the protesters. At least 11 were injured. Erdogan watched the attack unfold from his black Mercedes-Benz, which was parked outside of the embassy. Video recordings show that he may even have ordered his bodyguards and supporters like Yildirim to launch the assault on the protesters. Last week, the House unanimously passed a bill condemning the Turkish government over the incident. Despite the arrest of Yildirim and another Erdogan goon, some of the men involved in the attack likely will not be arrested or punished. Erdogan’s personal bodyguards and the embassy’s security detail are likely protected by diplomatic immunity from prosecution. The U.S. government could punish the Turks in another way, including through diplomatic channels. At least two lawmakers have called on the U.S. State Department to halt the planned sale of $1.6 million worth of firearms to the Turkish security detail. “The Department would like to thank the Department of Justice and the investigative agencies for their diligence,” the State Department said in its statement to TheDC. The Metro police department says that additional information about the case will be released on Thursday. A call placed to Yildirim’s phone went directly to voicemail.